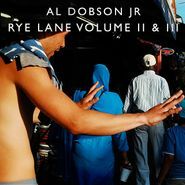 Al Dobson Jr.'s first 'Rye Lane' volume is one of Rhythm Section's biggest hits, a real mission statement for Bradley Zero's outpost of contemporary organic house. There are twenty-eight tracks between the two new volumes, which is obviously a lot to dig through, but Dobson keeps them to the point, adapting his bumping, handmade house style to a kind of beat tape approach. This is a huge tip for fans of the label, as well as everyone from Theo Parrish to Gilles Peterson!